The stress fractures within the Maoist party have been evident to outsiders for quite some time now. If there was any doubt, the disastrous Hetauda general convention in February last year, bought out the intra-party dispute over leadership into full public view. Baburam Bhattarai, unhappy at having to share his vice-chairmanship with Narayan Kaji Shrestha, resigned from his post as a form of protest. Subsequently all vital positions, except that of Chairman Pushpa Kamal Dahal, were disbanded. Even CA-2 elections could not narrow the widening chasm between Dahal and Bhattarai and ultimately, the two leaders’ lack of foresight led to the party’s humiliating defeat in polls. To avoid the ire of the rank and file and to save his own skin, the chairman immediately accused other parties of electoral fraud and threatened to boycott the results. 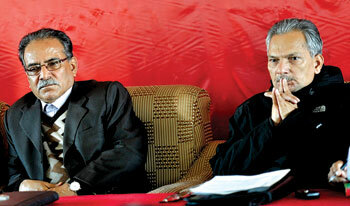 But Bhattarai was in no mood to back down and seized the perfect opportunity to question Dahal’s leadership. His announcement on Facebook that the UCPN (Maoist) would take part in the future CA, marked a significant change of guard. While the long-simmering?internal quarrels now threaten to tear the party apart, the UCPN (M)’s fall from grace started much earlier: on the day Bhattarai dissolved the first CA. It had taken only two years in mainstream politics for the Maoists to trounce the old heavyweights in the 2008 elections. But instead of seizing this historical moment, they allowed petty political interests to take precedence on the assembly floor. Their unwillingness to compromise on ethnic federalism and failure to conclude the peace process on time, also worked against the party. The prime cause behind the Maoist party’s tragic downfall lies in its legacy of dogmatic ideology, monolithic organisation, and the culture of hedonistic consumerism that Dahal so clearly exemplifies. Even after having joined the peace-process, the Maoists continued with the same the organisational structure that they had during their days in the jungle. However, leadership during times of peace demands vastly different skill sets: a great degree of flexibility and openness and the willingness to hear out dissenting voices. The UCPN (M) antiquated form of leadership was no longer adequate to placate the three factions – Dahal, Bhattarai, Baidya – that were already conspicuous inside the party. Unsurprisingly, Baidya and co decided to part ways from the mother party right after the end of the first CA. The process of disintegration of the Maoist party which began with the dissolution of the CA, was accelerated during the Hetauda Congress, and is currently nearing its final collapse. The defeat in November elections only widened the rift and has exacerbated the dispute over leadership. However, this is in no way a politico-ideological clash; rather it is a personal contention for party leadership between Dahal and Bhattarai. It is highly unlikely that Chairman Dahal will meekly surrender the reins of the party to his deputy. The man will go down fighting. 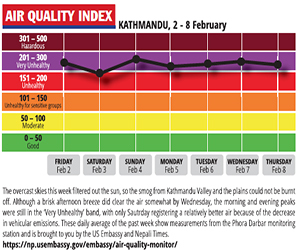 But after more than 20 years in waiting, the stars seem to be finally favouring Bhattarai. All is quiet on the western front, but for how much longer?